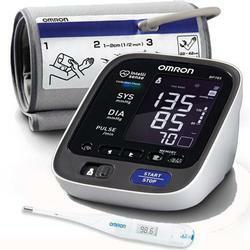 The Omron® 10 Series Upper Arm Blood Pressure Monitor (BP785) provides you with the highest level of assurance that your monitor is accurate with the Calibration Check System. The Omron® 10 Series Upper Arm Blood Pressure Monitor (BP785) provides you with the highest level of assurance that your monitor is accurate with the Calibration Check System. The 10 Series features a Two User Mode and includes a pre-formed ComFit™ Cuff that expands to fit regular and large sized arms. A Cuff Wrap Guide Indicator on the monitor will confirm the cuff is wrapped correctly.